The Geemarc AmpliDECT 350 Additional Handset can be linked with the AmpliDECT 350 to form a twin set of phones or linked with the AmpliDECT 350 with up to four additional handsets. The Geemarc AmpliDECT 350 is ideal for anybody with hearing difficulties. The AmpliDECT 350 has improved circuitry designed to reduce interference during calls. A total of four Geemarc AmpliDECT 350 handsets can be linked with the capability of call transfer and intercom. 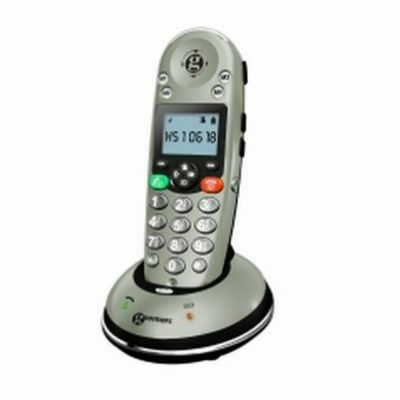 The Geemarc AmpliDECT 350 Cordless Amplified Telephone has a receiver volume of up to 30dB, which is three to four times as loud as a normal phone. The very loud ringing volume and tone can also be adjusted. This amplified cordless phone for the hard of hearing from Geemarc comes with Caller ID, a vibrating and visual ring indicator and handsfree speakerphone. Can I Use this Handset with Other AmpliDECT Systems? Yes, this Additional Handset is compatible with all other AmpliDECT systems. This includes the AmpliDECT 250, which was the previous version of this telephone. Please note that this is an additional handset for the AmpliDECT 350. Excellent but the set up was a problem. The literature should have how to connect with other geemarc phones!